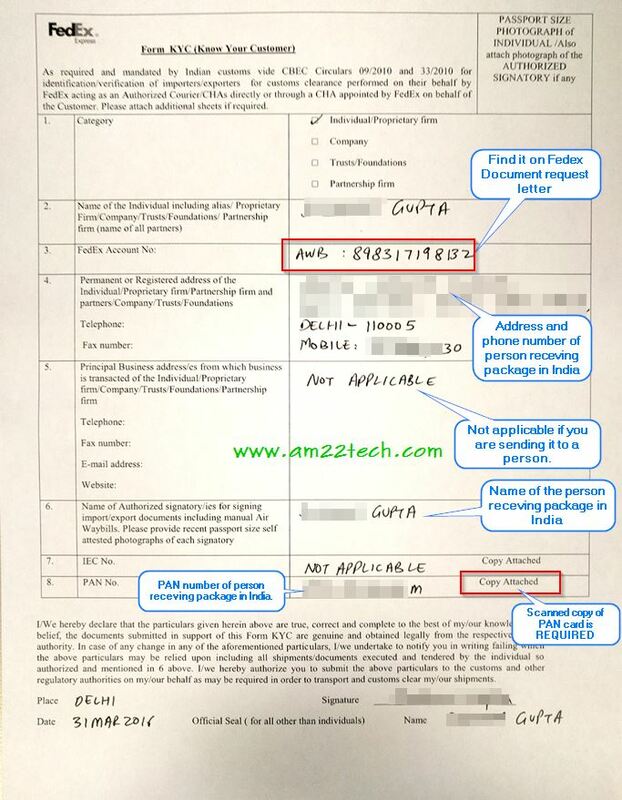 Mobile to India Custom Duty and GST Tax? Yes, GST Tax is charged on imported goods including mobile and is part of custom duty. The most updated GST rate is mentioned in this article for mobiles. 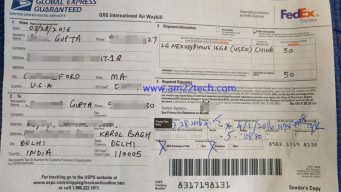 This is my own experience about sending a used mobile phone by postal mail from USA to India with USPS (United states Postal Service) as the shipping company. Which mailing service is reliable, cheap, fast and offers custom clearance in India? 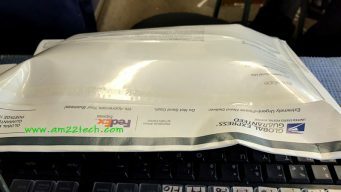 Fedex is most expensive with the cost for 1 LB package around $116. UPS has price tagged at $109. USPS starts their pricing from $61.45 for priority mail international. The biggest drawback with USPS though is, they use India Post as their delivery partner in India for all their priority mail international services and takes about 7-10 days with NO custom clearance help. Most of the people would use the USPS priority mail service but I would not recommend it. Instead, use USPS’s another product named ‘Global Delivery Express‘. This, simply for, it uses Fedex delivery in India and they take the pain of custom clearances on your behalf. USPS Global Delivery Express costs $108.80 with insurance, tracking and 3-5 day guaranteed delivery in India (They use Fedex to deliver in India instead of India Post). I know that it is almost the same price as UPS and a bit less than Fedex. But, you don’t have many options if you want reliability, custom clearance help and faster service. Even if you have time to spare and don’t care about speed, I would still strongly recommend to use this USPS service. Now, when this package reaches India, you will have to pay customs duties and taxes. Don’t worry, you will get a call from the Fedex or a delivery guy will contact you immediately with the documents that you need to furnish. In our case, the Fedex delivery person hand-delivered the list of documents to be submitted with instructions on 3rd day itself and that too after 5 PM. 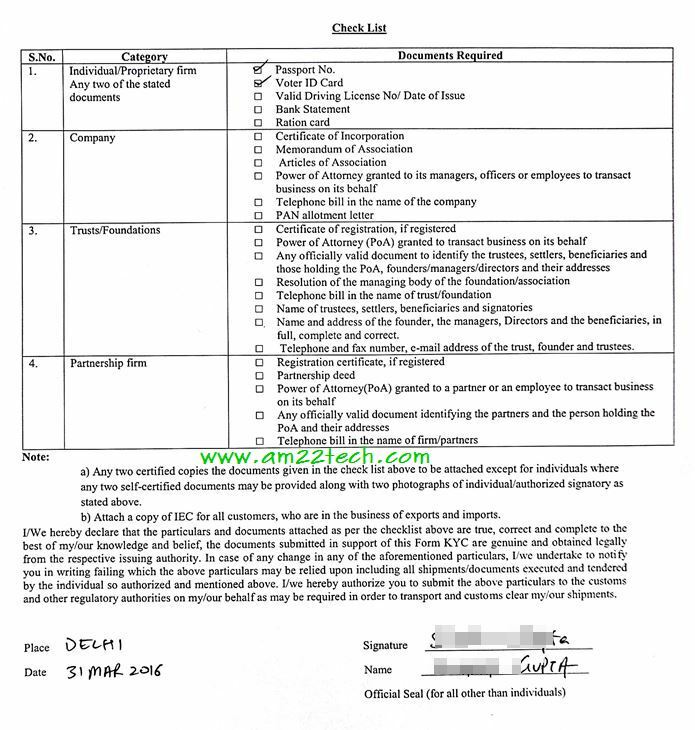 You can pre-prepare yourself and collect these documents, to expedite the custom clearance. Note all the documents here should be of the person receiving package in India. 2 Passport Size photograph. If you are sending documents by email, just send one digital copy. Documents to be downloaded and then filled up by person receiving package in India. 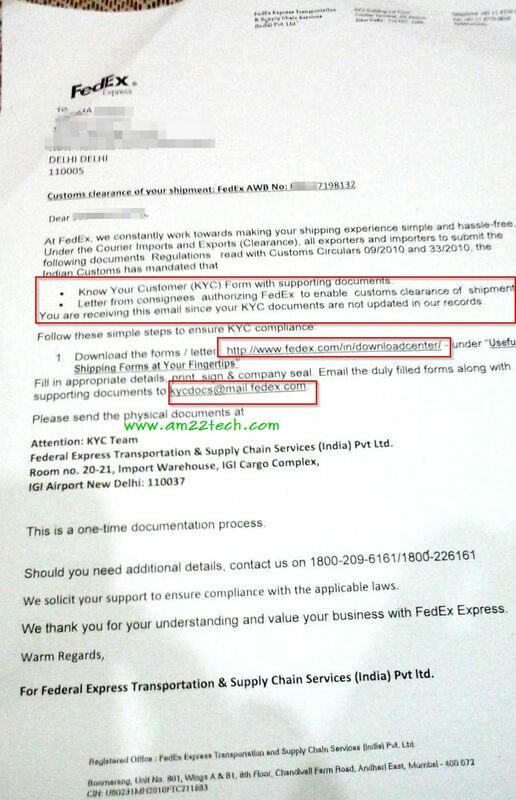 Download the KYC Form (Know Your Customer Form) and Authorization Letter from this Fedex India link under section ‘Useful Shipping Forms at Your Fingertips‘. 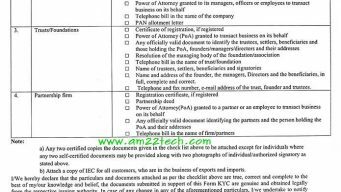 KYC form has the ‘Checklist’ included in one single download. Fedex Authorization Letter (For getting your package cleared by Fedex on your behalf). 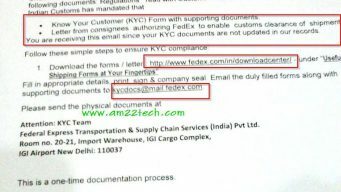 You can easily send the KYC form, checklist and other scanned copies of documentary proof by email kycdocs@mail.fedex.com with subject as your FEDEX AWD number. You will find Fedex AWD number on the top of document demand letter. See sample above. Remember, this is NOT same as USPS tracking code that you would have got in USA. This custom duty percentage keeps changing from time to time as government revises the tax rate. When I had shipped it, there was no GST tax applicable. CIF cost means the total of Cost, Insurance and Freight. This is precisely the value that custom’s values your imported item at. The other charges are calculated on this CIF value. 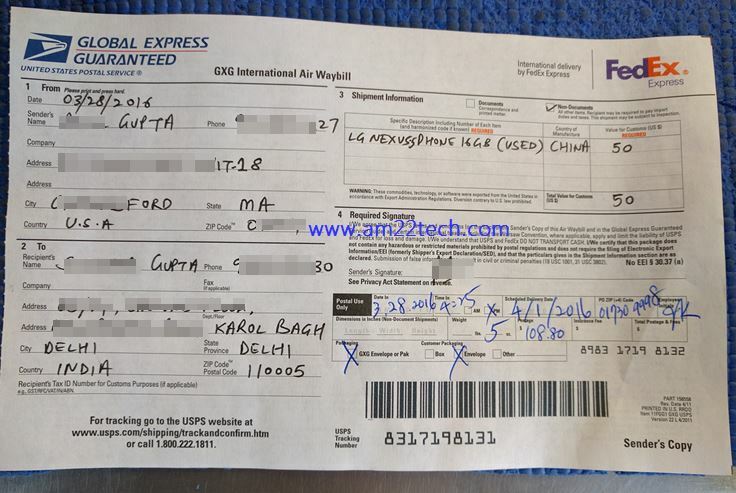 You would need to pay this fees (INR 2399) at the time of delivery to the Fedex person by CASH. They will provide the receipt too (as shown above) with your package. 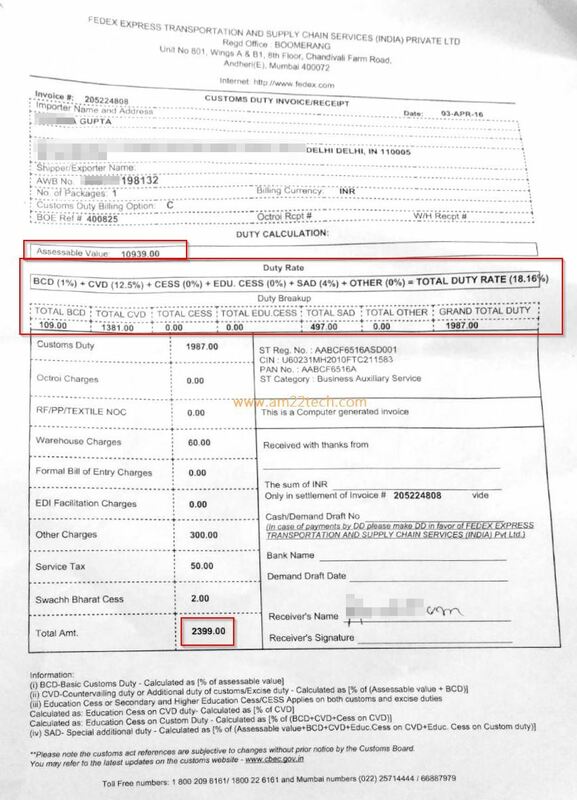 Add to this, the cost of custom duty as charged as you can see the final hit to your pocket. 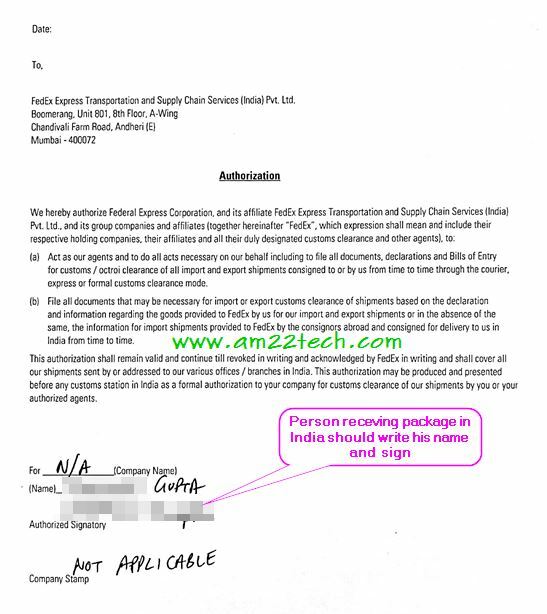 Marking the parcel as GIFT to evade custom duty/tax? This would be the next best advice you will get from any fellow desi abroad. Well, that is true, but to a certain extent. Remember, customs in India are also the same desi with same mindset! haha. So, you can ONLY gift up-to INR 10,000 worth of single package and that too without bill. The value of 10K is converted value after applying relevant exchange rate. Also, postal charges or airfreight or insurance is not taken into account to find the value of product. Who can be a sender of GIFT to send mobile to India? Any person abroad can send gifts. There is no specific restriction that only relatives can send the goods. Business associate, friends, relatives, companies or acquaintances can also send the gifts to residents in India. No proof is required. What is the total time frame to ship mobile to India from USA? This service by USPS (with Fedex) takes about total of 3-5 working days if there is no custom clearance delay. If you are submitting the KYC and supporting identity proof documents for the first time to Fedex, there will certainly be a delay of at-least 2-3 days. I am Gitansh from Delhi I want to buy a phone from amazon us portal can you tell me how much I have to pay more for a refurbished 460$ Phone. Please also tell me the Procedure too. I want to sent Indian bought Phone from USA to India. I bought OnePlus Phone in India, now I moved to USA. I bought new phone here and want to send my old OnePlus phone back to India. I have amazon.in bill also. Do I still need to pay tax and other things?? You will still have to pay customs duty. I do not think the Indian bill will be honored by customs. 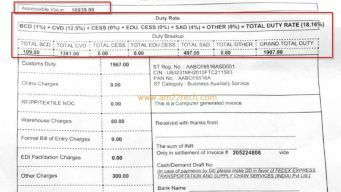 The normal practice is to declare and get a receipt from Indian customs at the time of leaving India, when somebody carries extra phone (or laptops) abroad. They can then show it to customs when they return to avoid the otherwise applicable duty on imports. Now, in your case, you do not have that receipt from Indian customs that you brought this phone from India to US. And second, you want to send it by post to India. It is not possible to prove that this phone is what you brought to US and now sending back to India. I have not heard of any case which may have skipped custom duty with same scenario. Well, the importer (receiver) in India will have to get the import license and register for GST tax payments, if you are sending all packages to same address and same person. If you are sending it to different person every-time, they still have to pay custom duties based on the declared value. Custom duty = 34% of total cost. What is Singapo SPack carrier and how long it takes to reach India sir? I am not sure what it is as i have never used it. Anil Sir The Seller Declared Value as $30 and marked as Gift On the Courier Package?. Still have to Pay the customs, if yes then how much it would be sir? its iPhone 6s. i bought it in ebay for $207 , but seller marked as a gift and even does not included the invoice and declared the value $30 on the package. Can i get in any trouble with customs sir? Yes, you can if they inspect it. If they Can inspect, i have to pay customs on that product, right sir? Whether i have to pay the whole $207 or 33.3% of $207 Sir? Okay. Thank You So Much Sir. First time i’m importing mobile from Another Countries, so having bit tensed. You will have to pay Custom duty on the value that custom officer will assess. FedEx sent me an email asking for KYC forms and IEC. Should I apply for IEC and where do I find My AWD number ? Cant seem to find it anywhere. 1. The Fedex AWD number is written on TOP of the document demand letter. See the screen shot shared above. You should receive the hard copy in your postal mail. If not, then ask by replying to the email you have received. 2. There is no need to register for IEC if you do not intend to buy and sell products. Thanks. I’ve got all the papers ready. Only problem is that there are two names (mine and the acc name made for purchase) as the receiver name on the package, will it be a problem ? No. That should not be an issue. Can I provide KYC forms and receive goods on behalf of a person from the same household ? Also is it necessary to provide PAN card copy and not just Aadhar card ? Yes, i think they will deliver the goods if the KYC is from same household. Can the shipper only change the address or can I contact FedEx support to do so ? There’s been a slight mistake in the AWB and now I cant file for customs clearance. I don’t think you can change the shipping address yourself. You may want to call Fedex and ask.